Decision: Should You Play Distraction? Perhaps the most obvious use of Distraction is to open or close distance between models. Simply put, Distraction effectively increases the range of one of your attacks by 1, or decreases the range of your opponents' attack by one. As we will find in many cases throughout this article, this effectiveness of Distraction here correlates directly with the skill of the player playing it; this effective change to range can be utilized either as a 1-time effect to set up a single attack or as a multiple use effect. For example, if you use Distraction to push a model into charge range, you get to make one attack against that model that you wouldn't have been able to make normally. However, if you use Distraction to push a model adjacent to one of yours, you may get to make several attacks that you normally would not have been able to make. If we compare Distraction to, for example, Commanding Reach, we'll find that Distraction is the better card in almost every way. Similarly, using Distraction in different ways may result in avoiding a single attack or many. Again, when compared to a card like Darkness Descends - which has the potential to save you from a single attack - Distraction handily comes out on top in almost all situations. Distraction's effect is simple, and to an extent it may feel small. 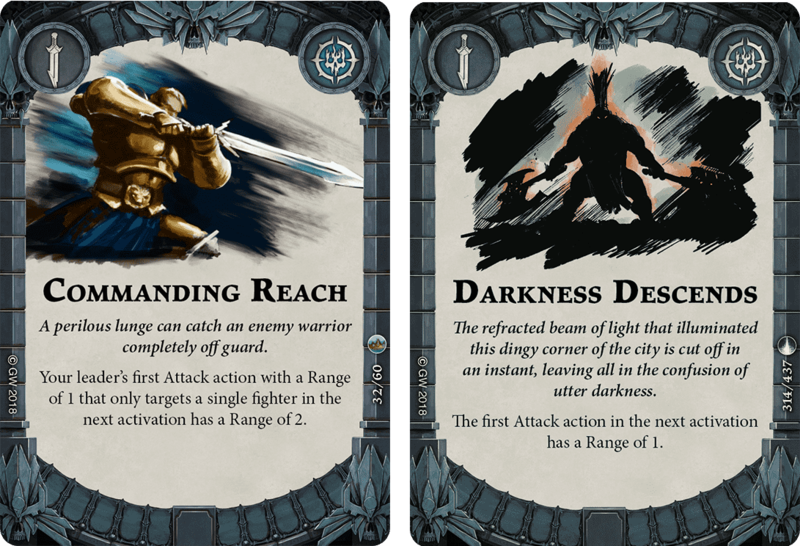 However, it's important to remember the range of the card's usefulness expands with experience and play skill. 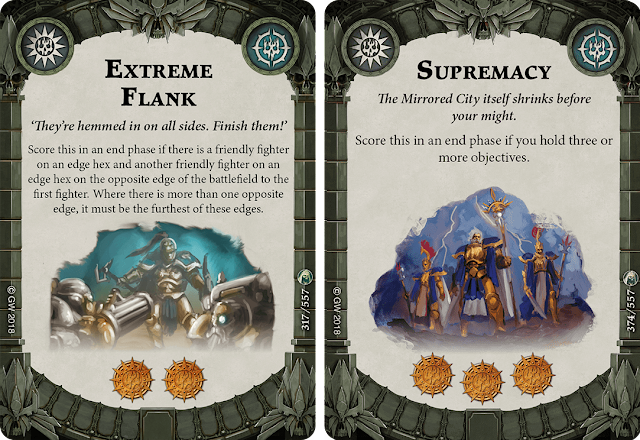 The better you get at Shadespire, the better Distraction will feel to you. Finally, it's worth noting for this particular use of Distraction that warbands with lower movement scores benefit more from Distraction than faster warbands. 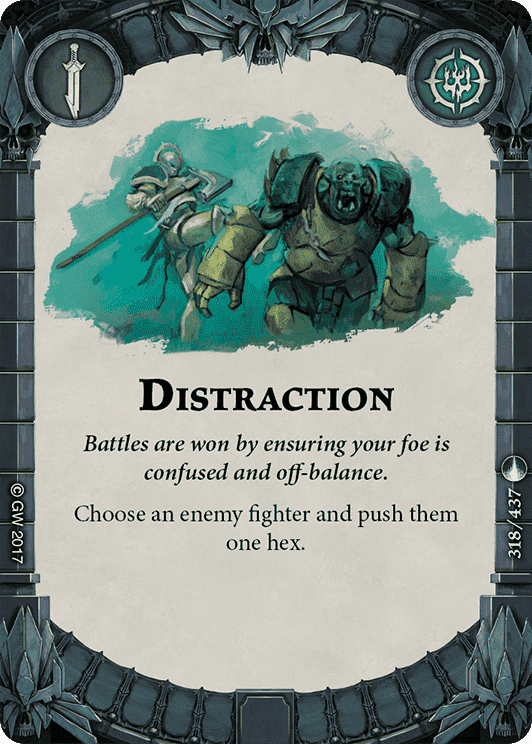 This is simply because Distraction's push represents a greater change in relative board state for slower warbands than faster ones. For example, Distraction represents a 33% increase in effective charge range for a petitioner (3 to 4), while it represents only a 14% gain for Skritch (7 to 8). 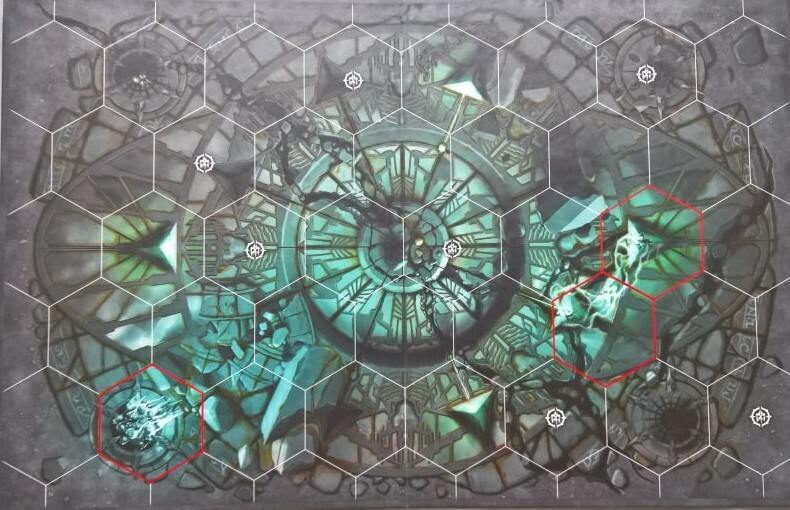 If you (or your opponent) are fond of using boards that have lethal hexes, you gain additional utility from Distraction, as you can use it to push models into them. 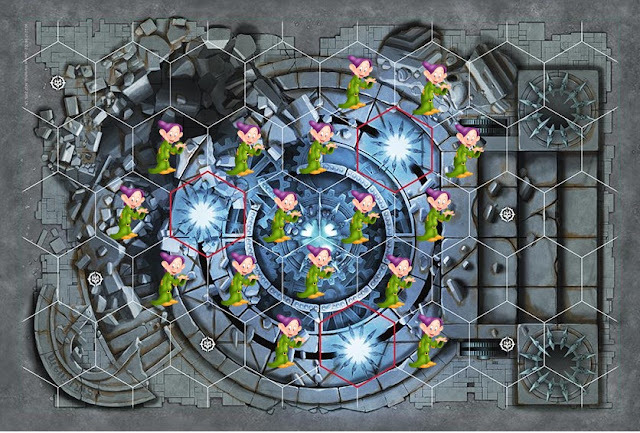 In the example board above, you can use Distraction to push any one of the dopey dwarves into the fire. 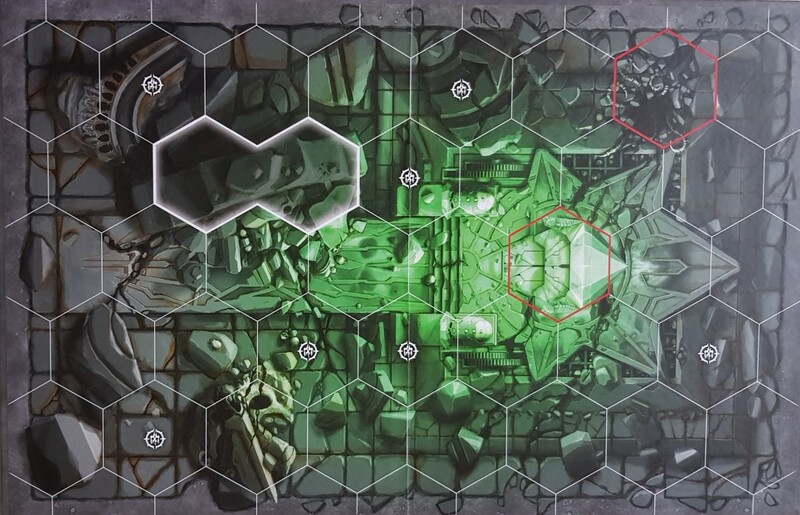 This board represents what is probably the highest degree of utility for this strategy, as the 16 "dopey" hexes make up 42% of the total occupiable hexes on the board! One last thing: don't plan to use this strategy against the Thorns of the Briar Queen, you cup of baby carrots; you'll get laughed at. With the recent rise of "mid-range" decks that tend to play passively in the early stages of the game then come out swinging with highly upgraded models later on, early game objective disruption is more important than ever. Many of the passive objectives used by these kinds of decks are positional, and can be disrupted with Distraction. 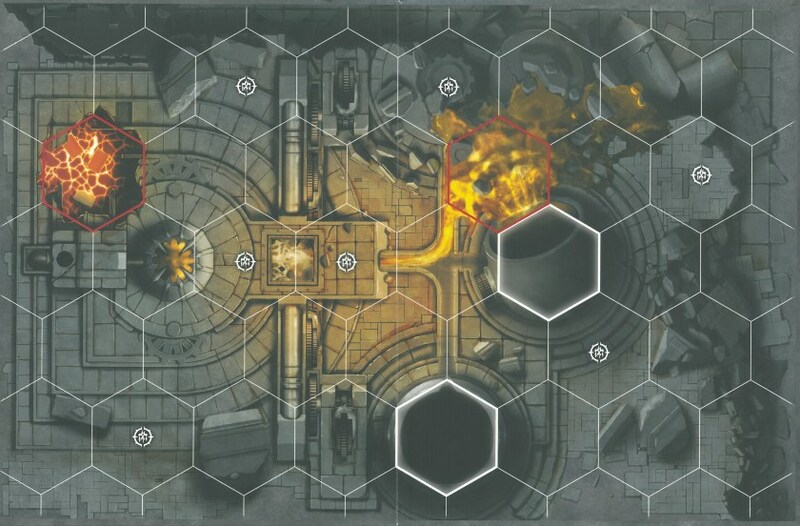 Some of the most obvious choices for this kind of disruption are power objectives like Supremacy and Extreme Flank, but there are many other objectives that can be disrupted with Distraction. There are so many, in fact, that it's easier to provide a picture than a list. 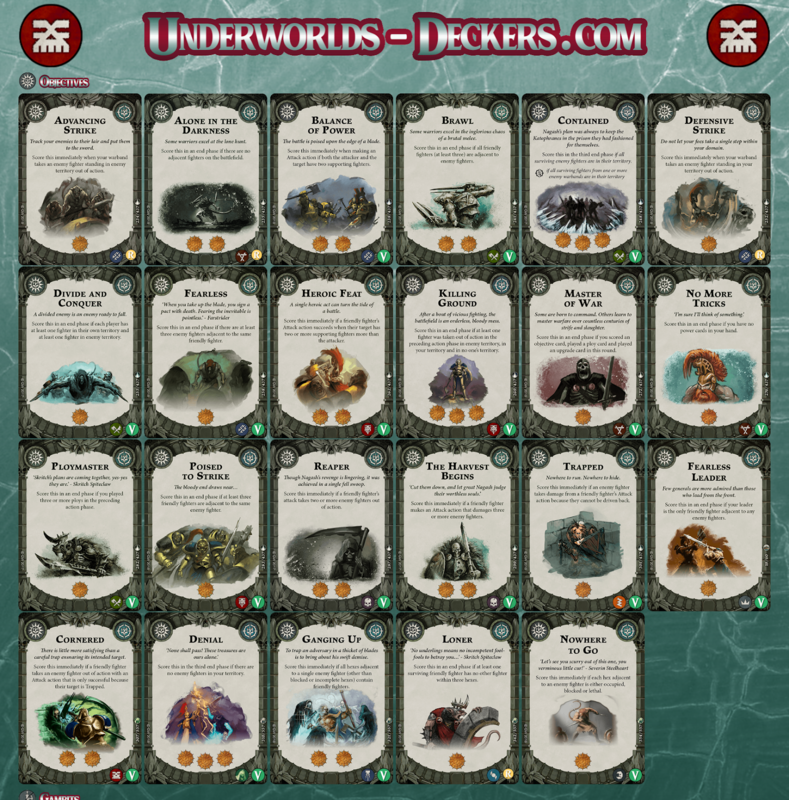 So, courtesy of Underworld's Deckers, here's a picture, and a link! 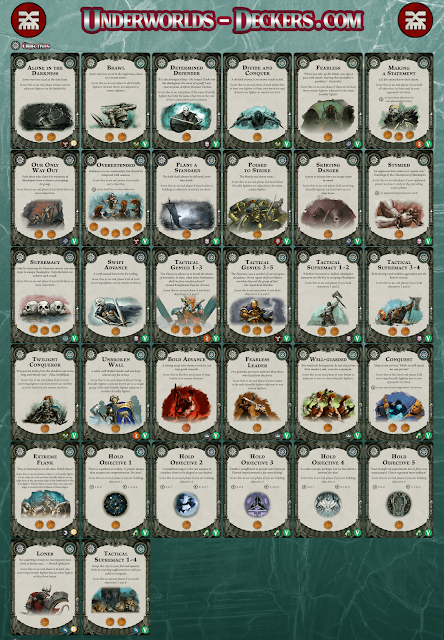 For those of you who are curious, that's 32 objectives that are easily and clearly (no intricate machinations required) disrupted by Distraction - representing just shy of one quarter of all the universal objectives! Please note that, contrary to prior policy, I've included cards like Ploymaster and Master of War here. 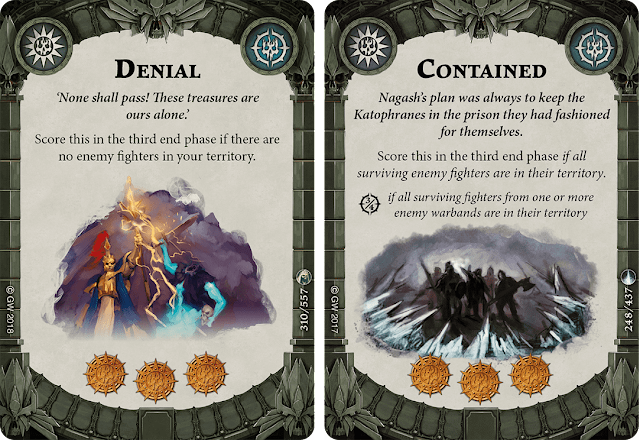 Normally, I don't consider these cards to form "combos" with most ploys, because literally any ploy will work (Spoils of Battle and Master of War being an exception). However, I'm including them in this case because Distraction is so easy to play, that you'll never end up holding on to it if you don't want to. Unless you've killed literally every enemy model - in which case you're probably not worried about scoring Ploymaster - you always have a target for Distraction. In total, the above objectives represent 17% of all of the available universal objectives (23/132). Comparison of Sidestep and Distraction is damn near impossible. They're both so versatile and flexible that there are nearly infinite situations in which they could each be used. However, for simplicity sake, we can examine the above mentioned factors to some extent. 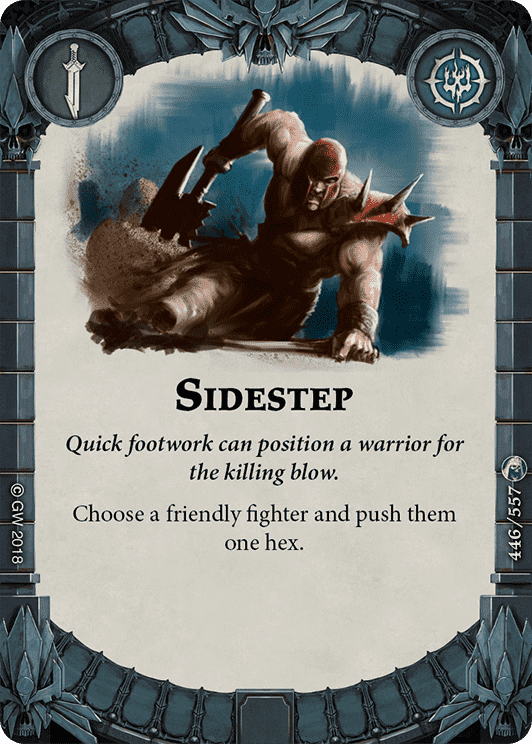 For starters, Sidestep will open and close distance in essentially the same manner as Distraction, so we can call them equal there. Sidestep can't be used to push enemy models into lethal hexes, but it can be used to bail your model out of dopey hexes, so it's probably a wash there too. As for adjuncts and disruption, we could essentially switch the two lists and maintain a fair degree of accuracy; Sidestep is less useful for disruption, but more useful for helping you score your own objectives. In the end, it's that last factor that should determine which you play. If you're more concerned with scoring points (Goblins) or moving your own models into specific places (Farstriders/Dwarves), you should probably play Sidestep. If you are more concerned with preventing your opponent from scoring (Defensive Sigmar) or pinging damage (Cursebreaker Spellswarm), you should play Distraction. But honestly, you should probably play both. Distraction is a fantastically flexible card that can fit into literally any deck. While it may, at first, appear as filler for this reason, we don't think it's an exaggeration to say that you really should be comparing literally every other ploy you choose to it; when you select a ploy for your deck, ask yourself :"Is this ploy really more useful to me than Distraction?" We think you'll find that most of you will end up answering that question with a "no" at least once in your decks.